I recently received a copy of Susan Whitfield’s novel Hell Swamp, and boy was I impressed. 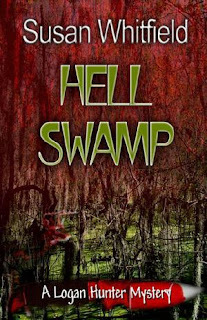 Hell Swamp is the third Logan Hunter novel (at the moment there are four total), a series of mystery novels set in different locales across the state of North Carolina. The author is a native of the Tar Heel state, so we’ll spare her any criticism for not setting her books in the real Carolina to the south. Sorry. My wife made me put that dig in there. She’s a South Carolina native, so she’s partial. Personally, I think all the North and South Carolina back and forth is silly. Everyone knows that the Tennessee is the promised land. Ahem. Yeah, so back to the review. 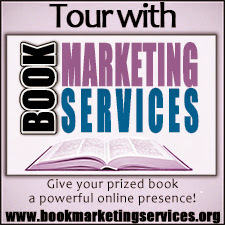 Logan Hunter works as an agent with the North Carolina State Bureau of Investigation (SBI) as a homicide investigator for cases that the local constabulary either can’t or won’t handle themselves. She’s tall, feisty, and one hell of a detective. There’s more to her than that, but I’ll let the author tell you all about it, seeing as she can tell it way better than I can. 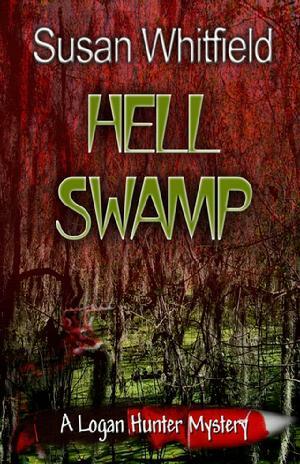 The events of Hell Swamp take Agent Hunter to Pender County, North Carolina, a rural area along the Black river way back in the sticks. It also happens to be the home of the novel’s namesake, an inviting little place called Hell Swamp full of wonderful things like alligators and snakes and mosquitos about three hundred other things that can eat you alive. A local animal rights activist (and town-crazy lady) has been found in her home strung up from her chandelier and gutted like an eight point buck. When she learns that the victim was militant and threatening in her activism (while living in prime hunting territory, no less), she immediately steers her investigation toward the local hunting community. She interviews a dizzying array of personalities, almost all of which have some sort of motive for the murder, but not one of them seems good for it. Undaunted, Logan keeps digging. She gets help from her fiancé and fellow SBI Agent Chase Railey along the way, is nearly killed twice, and keeps pushing until she finally starts to unravel the mystery of Hell Swamp. What struck me most about this book was the setting. Whitfield describes it in vivid detail, so much so that I was able to envision the scenes perfectly in my mind’s eye. It helped that I’ve spent a lot of time in the Low Country of South Carolina, riding on the Waccamaw River, slogging through swamps and fishing the backwaters of the low country reservoirs, but a lot of credit goes to the author for so brilliantly capturing the essence of the locale. The novel also reads like a southern cookbook. There is hardly a chapter that goes by that doesn’t have some sort of mouth-watering meal described. And the murder mystery itself is quite intriguing, with Hunter being pulled in different directions and never quite knowing who to expect. I called the murderer about halfway in (I said I was a know-it-all, didn’t I), but by the end of it Whitfield had me rethinking my initial assessment. She kept it interesting, and sometimes with crime/mystery stories that can be easier said than done. There were some little things in the narrative, however, that struck me as odd. For one, the story’s climax just seemed to kind of… happen. There was the appropriate lead-up and pacing of course, but all of the principle players showed up at the same place at the same time with little explanation of how they got there or why. I can see there being possible reasons for everything taking place the way it did, but none of it was really explained to my satisfaction within the narrative. But then again, maybe I’m just hard to please. Logan also fired her service weapon in order to stop an old man who was walking away and then threatened said old man by putting her gun against his head. That’s not something (as far as I know) that a trained investigator would do, especially when the said old man hadn’t done anything threatening and wasn’t even a suspect at the time. It didn’t have a critical bearing on the story as a whole, but it was still a little jarring. Also, later on in the narrative one of the characters dies from drinking Wild Turkey spiked with antifreeze. Now antifreeze can kill you, no doubt, but here’s the problem: ethylene glycol (the main ingredient in anti-freeze) is sweet tasting, hence the reason why dogs commonly die from eating it. If a sweet, viscous substance like antifreeze was added to Wild Turkey, I would think that anybody who’d ever tasted whiskey before (and this fellow was well acquainted with his alcohol) would notice something was wrong immediately, and one swallow probably wouldn’t be enough to kill. Anti-freeze has been used in deliberate poisonings before, but it’s been added to things that were supposed to be sweet, not straight liquor. Plus, wasting a good whiskey like that is just cruel. If you’re going to ruin some whiskey by adding anti-freeze, use something that’s already foul like Four Roses or George Dickel. But that’s just the whiskey drinker in me talking. Despite all my whining Hell Swamp was still a good book to get lost in for a few hours. Of all things I mentioned, not one of them was important enough to ruin my enjoyment of the book. The setting is immersive, the characters are intriguing, and mystery is one hell (pardon the pun) of a ride. The graphic below says three stars, but the folks counting at home will probably want to consider it more like a three and a half. For more information about Susan Whitfield and her work you can check out my recent interview with Susan or visit her website or blog. 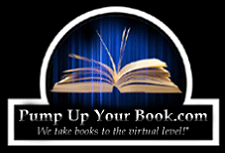 At her website you can purchase signed copies of Hell Swamp or any of her other books, and unsigned copies can be had from Amazon or any other fine book retailers.